Its mulberry time again! 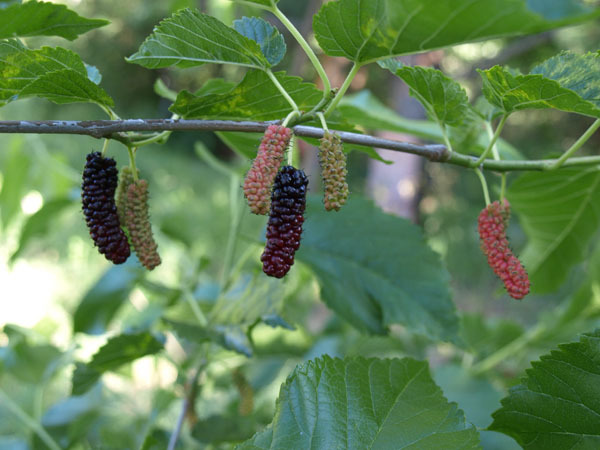 We’re pleased to be bringing mulberries back to the market again. Originally we planted them as a trap crop , an attempt to divert the birds away from our cherries. (See the Birds and Cherries post from July 13) It works somewhat, the birds still want to eat cherries but it seems to help. It didn’t take us long to figure out that besides their utilitarian duty they are really good to eat, so we figured out a way to harvest them and bring the luscious fruit to the market. The variety we grow is called Illinois Everbearing, it begins to ripen early to mid July and goes in to August. The peak harvest is now and then it continues to decline until they’re done. 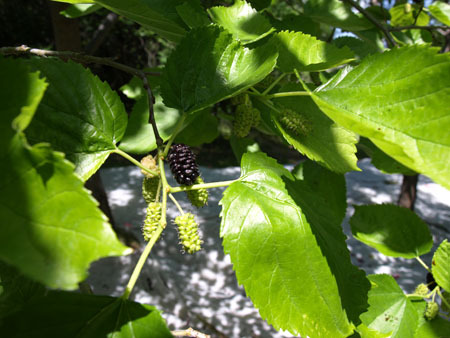 I highly recommend planting a Mulberry tree or two, but be warned: they make a mess! That month and a half ripening time equals many fruits on the ground, so think carefully about where it wouldn’t be a problem and enjoy. One of the biggest challenges to raising cherries (besides rain or cold spring weather) is birds. They just love the fruit, and cherries seem to fit in their life style perfectly, bite size and (usually) bigger, leafy trees to glide in and out of easily unseen. And who can blame them? Cherries are a great fruit. 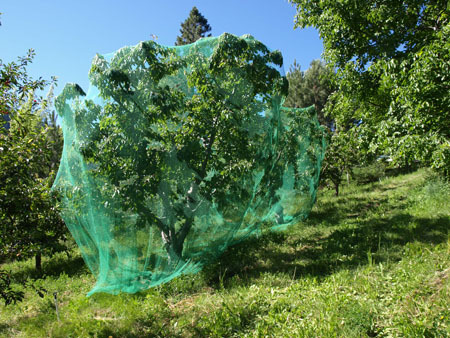 For our earliest variety (Chelan) we have to net the tree or we won’t get any fruit from them. We also usually net our next variety (Van) , but by then the Service berries and Mulberries are starting to ripen and the birds diffuse a bit , still eating some cherries, but not as concentrated as when the Chelans are the only fruit anywhere close to ripe. When we have a full crop in the trees , the birds get a bunch of fruit but there’s usually enough for us, when there’s a light crop we have to protect the fruit or we won’t get much at all. It seems like no matter what you use, with exception of netting, the birds adapt to whatever scheme you use and still manage to get some fruit. Some of the birds we have here during cherry time are American Robin (of course), Western Tanager, Bullocks Oriole, Cedar or Bohemian Waxwing , Red Shafted Flickers, Evening and Pine Grosbeaks, Stellar Jays and Starlings. We love birds and birdwatching, but it is frustrating and conflicting when they’re eating up our livelihood!